The unique SRC garment technology promotes muscle stimulation and activation by providing gentle compression / light pressure to the pelvis, back and abdominal muscles. This is not possible if you choose a corset, girdle, or rigid support garment. From day 1 you can be confident in the knowledge that your SRC Recovery shorts Mini length are doing their job even when you’re not active. Fitting like a second skin, the gentle compression helps you get mobile sooner after both a vaginal or C-section delivery. SRC compression garments provide gentle compression to a wound area. Whether you have had a C-section delivery or stitches/tears to the perineum, the SRC Recovery shorts Mini Length reduce wound swelling and pain and promote a faster and safer recovery . SRC Recovery Shorts Mini Length have been designed in consultation with obstetrician Dr. Grant Saffer. Anatomically designed support panels fit with the natural curves of the female anatomy whilst delivering consistent gentle medical grade compression at 4-15mmHg. The garment delivers exceptional fit and maximum support without any feeling of restriction. Designed for use in the first 8-10 weeks after delivery they can be worn for as long as they provide benefit, and many women continue to wear their recovery shorts for exercise or for aesthetic reasons under fitted clothing. Begin wearing your SRC Recovery Shorts Mini Length as soon as you feel able post-delivery. It may take a few days for your SRC Recovery Shorts Mini to feel fully comfortable because of fluid retention. Please be advised that if you have had stitches to the perineal area following a vaginal delivery you should change your maternity pad every 2 hours. DO NOT wear a pad that has a plastic backing. This may cause the area to sweat which will increase the risk of infection. Wash the area with salt water and dry well following each pad change. Wear your recovery shorts during the day only while your perineal stitches are healing. Once the area is fully healed you can wear them both day and night. SRC Recovery Shorts Mini can be worn both day and night. Wear your SRC Recovery Shorts Mini for as many hours as you wish. Your SRC Recovery Shorts Mini should feel supportive without any feeling of restriction. During pregnancy some women find that their ribs expand to accommodate the growing foetus. If so, the elastic at the top may feel a little tight even though the garment is otherwise comfortable. This is easily resolved by putting the elastic on continuous gentle stretch for a number of hours. Please contact us should you require further information. Alternate between your SRC Recovery Shorts Mini Length and your SRC Activate garment as soon as you feel you no longer require as much upper abdominal support throughout the entire day and the swelling of the upper abdominal area has significantly reduced. SRC Activate garments have been designed to allow you to comfortably return to exercise, all the while knowing that your pelvis, lower back and legs are supported. It is important to note that your SRC Recovery Shorts Mini will perform best when washed every 3 days. For continued support wear your SRC Activate Capri/Legging during this time. Truly more comfortable than pyjamas, SRC Shorts are especially useful to wear to bed. They provide the necessary support to minimize the effects of pelvic pain during sleep. 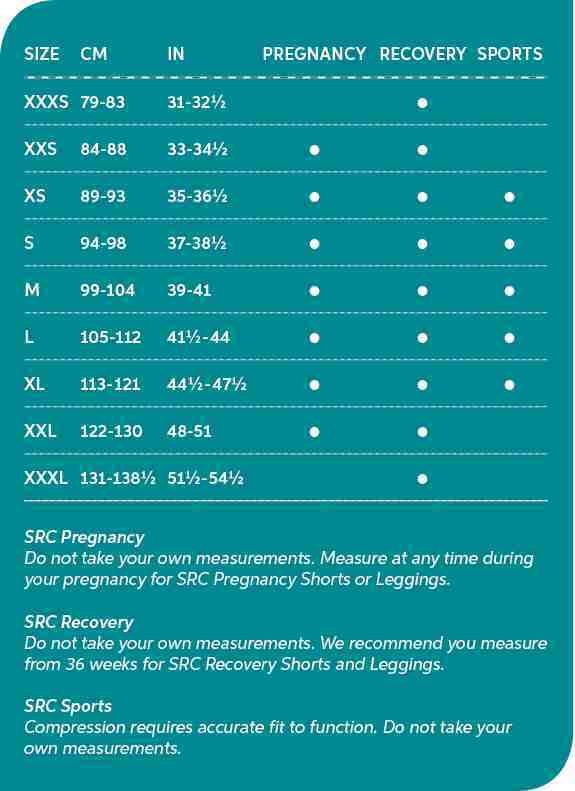 *Please note: SRC Pregnancy leggings have a gentle level of graduated compression in the legs. These are suitable for women with mild varicose veins or swelling. This product will not provide enough compression for moderate or severe varicose veins of the legs. Women often complain that wearing a grade 2 or 3 compression stocking for long periods can be difficult due to them becoming hot and tight. The SRC Leggings were designed with a specific level of compression so that women can wear their compression stockings under the SRC Leggings for a number of hours during the day. Once the compression stockings have been removed the SRC Leggings will continue to provide mild graduated compression so the benefit of having worn the stockings is not lost.